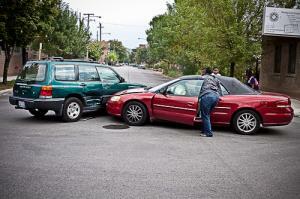 Our client, Terra, was injured in a T-bone collision caused by another driver. She was treated for her injuries for six months after the accident and eventually stopped receiving treatment, but her low back pain continued. Terra resumed medical treatment again approximately two years later, and her doctors later diagnosed her with a permanent low back injury. Her past medical expenses exceeded $9,000 and the defendant’s auto insurance carrier was Allstate. On the morning of February 14, 2001, 21-year-old Terra was on her way to class at the University of Washington, driving her 1983 Jeep on Brooklyn Avenue in the University District at approximately 30 mph when another driver then pulled out in front of her without yielding the right of way, resulting in a T-bone collision. Terra’s vehicle struck the passenger side of the defendant’s vehicle. The 80-year-old defendant claimed that he stopped before entering into the intersection, but that he could not see very far due to the sunshine. Terra’s vehicle sustained $4,000 in damage and the defendant’s vehicle was totaled. The collision threw Terra's head against the driver side door window. Her body was launched forward then bounced back upon impact. The person who hit her was not injured. The police arrived on the scene and cited the defendant for not yielding the right of way. Terra initially refused medical attention at the scene, but when her mother arrived and saw the golf-ball-sized lump on Terra’s head, she insisted that Terra see the family’s doctor that afternoon. By the time Terra saw her doctor a few hours later, she was also experiencing neck and back pain. The doctor diagnosed a neck and back strain and a contusion to the head. Terra was advised to go home and ice her injuries and take Ibuprofen for pain. Over the next three days Terra’s pain grew worse. At trial she said she felt like she had been beaten by baseball bats. About four months after the collision, Terra’s mother called the PCP for a back specialist because Terra’s lower back pain had not gone away. She saw an orthopedist doctor at Kruger Orthopedics Clinic in Edmonds, who prescribed 8 physical therapy sessions over the next 30 days. The doctor instructed the physical therapist to develop a home exercise program for Terra so she would not have to continue formal care. Terra completed her last physical therapy session approximately six months after the date of the collision. During a two-year hiatus from medical care, Terra continued to perform her exercises and stretching routines as instructed by her physical therapist. She continued to experience daily low back pain. Terra’s friends and family members all testified at trial that Terra complained about her back pain constantly. Terra testified at trial that over this two-year period she continued the exercise and stretching routine as taught by her physical therapist. While Terra was a full time student at UW, she was also employed in the shipping and receiving department of a small local production company. Her coworkers would later testify at trial that Terra always needed help moving objects at work and that she needed to take frequent breaks. During her hiatus from medical care, Terra maintained a full curriculum at the University of Washington. She graduated in four years with a degree in Anthropology. Terra’s mother would later tell the jury that her only daughter was an exceptional student and graduated with a 3.75 GPA. Terra returned to a physician in August 2003 and saw a new chiropractor. The chiropractor ordered an MRI scan of Terra’s lumbar spine. The MRI revealed that Terra had lower lumbar facet arthropathy which was consistent with traumatically induced arthritis to the facet joints. The MRI also revealed a very mild disc protrusion at L5-S1. Based on Terra’s MRI, the chiropractor recommended an epidural steroid injection by a medical doctor at Radiology Consultants of Washington. Terra’s back pain after this injection did not go away, which suggested that perhaps the L5-S1 disc protrusion was not the primary cause of pain in her back. Terra was then referred to a spine specialist in Seattle, who treated her for 18 months. He ordered additional physical therapy and later testified that Terra’s ongoing symptoms were consistent with a chronic lower back injury. The doctor’s impression was that Terra was suffering from a chronic injury to the lower lumbar facet joints. The disc protrusion at L5-S1 was also a secondary pain generator that could not be ruled out. Terra received another injection into her lumbar spine. This time the injection was inserted into Terra’s facet joints at L4-5. Terra responded well to this injection, which led her doctor to believe she was injured at joints L4-5 and L5-S1. At trial, Terra’s doctors testified that her injury was likely permanent. Terra's pain was constant and continuous over the previous four years. The only treatment options available for Terra were pain management, and she was recommended a course of spinal injections. She was considered to be a good candidate for a minimally invasive spine surgery known as a neurotomy, during which a hot needle being inserted into the spine. The defendant was insured by Allstate Insurance Company. In an effort to avoid trial, Terra submitted her case to the King County Superior Court mandatory arbitration program. In this type of proceeding, the court appoints an experienced attorney to hear a shortened version of the case and issue an award. The arbitrator later issued an award in favor of Terra in the amount of $30,000, which included her past medical expense of approximately $8,000. As soon as Terra was awarded funds the defendant appealed the arbitration, demanding that the case be tried before a 12-person jury. The defendant’s attorney repeatedly told plaintiff’s attorney that Terra’s injury was just a mild soft tissue back strain. Allstate’s last and final offer before trial was just $18,000. The defendant hired Dr. Patrick Bays to examine Terra's injuries and treatment. The doctor issued his 10-page report finding that Terra's treatment was reasonable and appropriate, even stating Terra’s disc protrusion and mild facet arthropathy were unrelated to the automobile collision and instead were caused by Terra’s high activity level. One week before trial, the defendant videotaped Dr. Bays’ trial testimony for the purpose of showing it to the jury. It turned out Dr. Bays had changed some of the statements in his report. We brought this to the court's attention as it violated discovery rules. Dr. Bays was then prohibited by the judge from offering medical testimony that differed from the opinions he issued in his 10-page report. Trial commenced on May 23, 2005 and lasted four days. The jury returned a verdict in the amount of $114,558. The defendant’s insurance limits with Allstate were just $100,000, and Allstate was forced to pay the excess amount above policy limits. The verdict exceeded the $30,000 arbitration award, obligating the defendant to pay for Terra's attorney fees and costs. The final judgment amount entered was for $154,212. While we expect that your doctor or medical professional has already explained this, we will briefly explain what a facet joint is. A facet joint is a relatively fixed joint that moves slightly during flexion and extension of the back. Mainly, facet joints provide stability to the vertebral column. Facet joints are coated with a small amount of low friction cartilage. A tiny sack surrounds each joint. This provides sticky lubrication for each joint, and each of these sacks is surrounded by many nerve fibers. These nerve endings send a painful signal to the brain when the facet joint becomes displaced or irritated. How do Facet Joint Injuries Occur? It is likely you have landed on this page because you or someone you know suffered a facet joint injury in a car accident. That’s not uncommon. A motor vehicle accident can cause a number of cervical or lumbar facet joint injuries. These ailments should not be taken lightly. Consult with a medical professional if you believe you are suffering from any of these injuries. Football players that take a big hit can also sustain facet joint injuries, as well as older people with significant wear and tear on their bodies. Is Facet Joint Pain Permanent? The answer to this question relies on the individual facts of your injury, but generally there are treatments that can permanently solve facet joint pain. A new cutting-edge technology called MRI-guided Focused Ultrasound (MRgFUS) is an image-guided, noninvasive way to deaden the nerve at each facet joint that is causing pain. Rather than use needles or probes and physically go into the spinal cord, MRgFUS uses sound waves to treat the injury at the source. MRgFUS sound waves come from many different angles and when they meet, heat is created at that point. You will rarely see a facet joint injury show up on an X-ray or MRI. When a patient is suffering from headaches, neck and back pain, shoulder pain, etc., following a car accident, physicians may assume these symptoms are related to a facet joint injury. Those who suffer a facet joint injury in a car accident usually require chiropractic treatment and/or physical therapy. A back brace or neck brace may be required to straighten the spinal column and get things back in working order. If those treatments don’t work, a physician may recommend spinal fusion surgery. There is, however, a negative stereotype when it comes to facet joint injuries and other ailments from car accidents that don’t show up on medical imaging. Whiplash injuries, including facet joint injuries, are soft-tissue injuries that are hard to prove. Even though you and your attorney know that your pain is real, it may be difficult to garner sympathy from the insurance company, judge or jury. These are very real injuries that should be taken seriously, so don’t let the stereotype deter you from pursuing compensation after an accident. A car accident victim with whiplash, facet pain, daily headaches, blurred vision, numbness in her hands and fingers, memory issues, and multilevel disc protrusions in the cervical spine received a $118,500 settlement. A client injured in a crash with a drunk driver received $121,033 in settlement money. The client suffered a long list of injuries, including aggravation of a degenerative spinal condition — including facet joint syndrome. A driver rear-ended by a drunk driver received $146,148 in settlement funds, money used to alleviate medical bills for a lumbar sprain and strain, as well as a facet joint injury. What Causes Facet Joint Hypertrophy? Unlike your standard facet joint injury, facet joint hypertrophy is a condition in which the facet joints of the spine become enlarged. With age, joints degenerate and may become enlarged, causing pain and symptoms such as stiffness, numbness, and deformity. Rheumatoid arthritis is a common cause of facet joint hypertrophy. The arthritis causes the lining of facet joints to be inflamed or swollen. Can a Car Accident Cause SI Joint Pain? One of the most common causes of sacroiliac (SI) joint pain is a fall or car accident. These events damage the SI joints and surrounding ligaments, sending pain signals to the brain. Activities such as running and other physically demanding sports can also cause SI joint pain. Terra suffered permanent back injuries in a collision after being t-boned by another driver. She underwent extensive medical treatment and accrued thousands of dollars in medical bills, and attorney Chris Davis recovered a $154,000 jury verdict on her behalf. Confidential Settlement After Serious Multi-Car Accident Victim suffers multiple fractures in multi-car accident. $200,000 Settlement For Injuries In Red Light Running Accident Driver runs red light causing serious injuries. DLG gets $200,000 settlement for victim.